Granulated Copper Sulfate algaecide. Also suited for treating areas to eliminate swimmer's itch. Copper Sulfate is a granulated algaecide great for treatment of pond and lake algae and is also suited for treating areas to eliminate swimmer's itch. Copper Sulfate Algaecide is an effective algae control product that also helps relieve Swimmer’s Itch and leech issues. 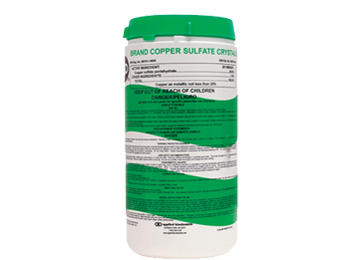 Copper Sulfate is a granular product and dissolves after application to water. We recommend using a broadcast spreader when applying copper sulfate to your pond or lake. *An additional HazMat shipping charge ($30.00) has been added to the 50 Pound price. 5# and 15# Manufactured by Applied Biochemists, a Lonza Business. 50# Manufactured by Chem One LTD.
How big is your pond? Use our Pond Calculator to find out! The copper sulfate has worked as advertised, we will continue to use it to control the growth of algae.